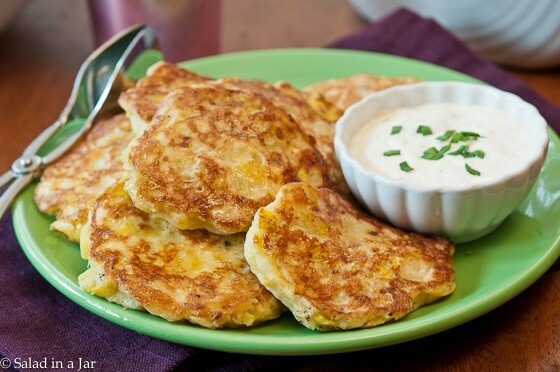 Squash Patties are mini-pancakes full of chopped, cooked yellow squash. Their mild flavor begs for a condiment. For this reason, I highly recommend serving with ranch dressing, catsup or something like this Cajun Dip. 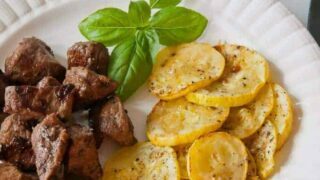 See the recipe notes to learn how to adapt these to a Keto diet. The recipe for these simple but delicious patties was given to me by my friend Ellen. She’s always been one of my favorites. 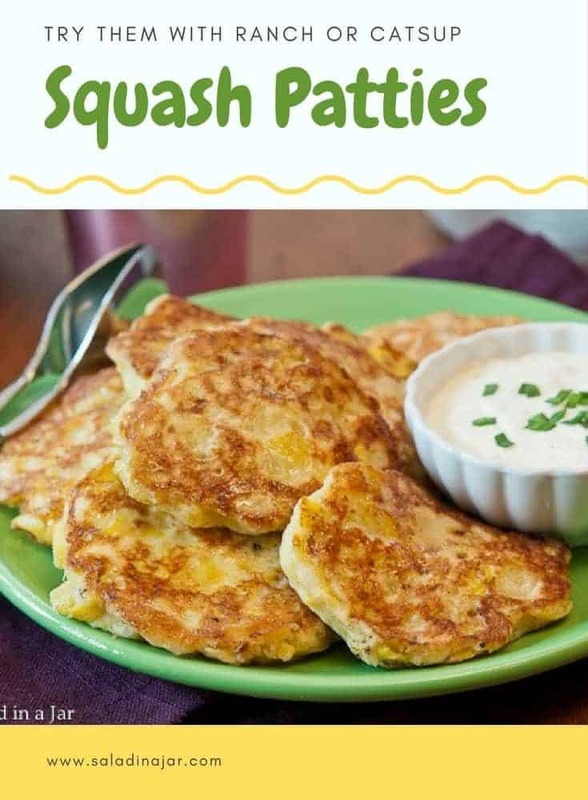 Written on the recipe is the following blurb: “This is the only way I can get Russ (her husband) to eat squash.” Likewise, if you have somebody in your family who thinks they don’t like squash, be sure you give these Squash Patties a try. Kids who prefer to eat with their hands will probably like these, too. If they want to dip everything into ranch dressing, you’re golden. However, our condiment of choice with these Squash Patties is catsup. 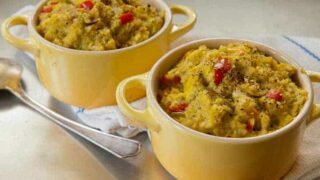 Finely chop yellow squash and place into microwave-safe glass bowl along with onions and peppers. Microwave approximately 10 minutes or until squash is completely cooked and soft. Drain well. 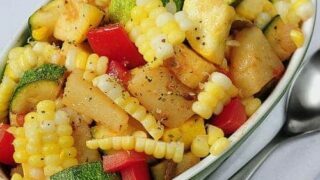 Add remaining ingredients to cooked squash and stir to combine. 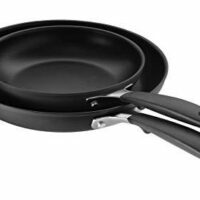 Heat large skillet on medium. Add 1 tablespoon oil. Drop by tablespoon of batter into the oil. Cook until browned on one side, then flip to brown the other side (similar to making pancakes). Make these Keto by substituting Wheat Belly's All-Purpose Baking Mix for the self-rising flour. 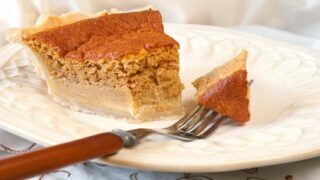 Substitute Swerve (erythritol) for the sugar or a few drops of Stevia. 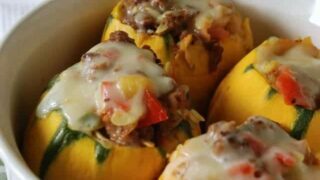 Unusual looking 8-ball squash with a familiar taste make a beautiful presentation stuffed with sausage and other veggies. Take another look at the recipe. The sugar is included in the “remaining ingredients” along with the egg, salt and pepper, etc. Read the recipe to compare the difference to my own. I omit sugar. I add one tablespoon of finely chopped sage (herb). The flavour is savory and delicious. Everyone comes back for more. Sometimes I omit the sage and add a quarter tspn smoked paprika. Its a spicy taste without the heat. And so, appeals to fussy eaters. We have lived a self-sufficient lifestyle for 40 years. 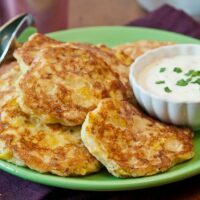 Accordingly my recipes are devrived from what is seasonally in the garden.I think my blog has a personal recipe for squash patties. Love Salad in a jar. 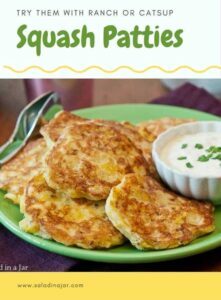 squash patties are wonderful. I used to boil my squash too….one day decided to grate it along with the onion….added the egg…flour, salt pepper….never boiled again. Yum! I’m going to try these on my 10 yr old picky eater…hmmm. I will let you know the results – I’m guessing he will roll his cute eyes and say…Mom, what’s in ’em this time! Wow! 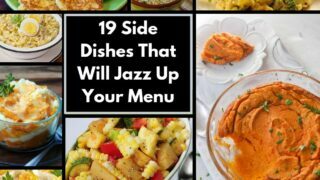 These paties look delicious. Thank you for having such a great site! You are an amazing cook!